No October would be complete with Halloween / Horror movies... or many many episodes of Mystery Science Theatre 3000 (for those in the know : MST3K). What, you don't spend hours crafting costumes, making geeky food, carving pumpkins, etc to episodes to MST3K? Maybe now is the time to start, or at least the time to start pairing them with a Halloween / Horror Movie. Introducing the October Movie Roll Call! First Up, Ventriloquist Dummies. Oh yes, the creepiest of dolls that follow your every move with those big painted eyes. 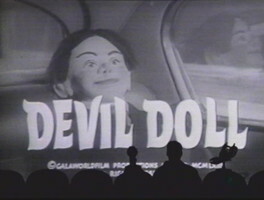 Mystery Science Theater 3000: Devil Doll (which aired on October 4th 1997). I'm not going to give you any more details besides the following teases. All you really need to know is: our favorite residents of the Satellite of Love watching a British horror film from 1964 about an evil ventriloquist, "The Great Vorelli," and his dummy Hugo. Oh and some fun gifs and images of course. So what do you pair with something so amazing as MST3K riffing on Devil Doll? Dead Silence, of course. The plot simplified makes me laugh a bit: A woman's murder may be linked to the ghost of a murdered ventriloquist. I think its safe to say regardless of humor or horror: old-school ventriloquist dummies are creepy*. So why not allow yourself to be a little scared this October with this double-feature? Check back next Friday for another edition of October Movie Roll Call (Double-Feature). * I think it is important to add I find ventriloquists fascinating. Have you ever watched Her Master's Voice (2012)? It is one of my favorite documentaries. Highly recommend. Its a beautiful story and you will wish you could throw your voice or speak without moving your lips.